Independent ice cream parlour, Caffe Cream of New Brighton, won the ‘Wirral Taste’ Award at the Visit Wirral Tourism Awards 2015. The annual event, which celebrates the peninsula’s tourism and hospitality industries that contribute to the £327m tourism economy in Wirral, took place at the Floral Pavilion in New Brighton. 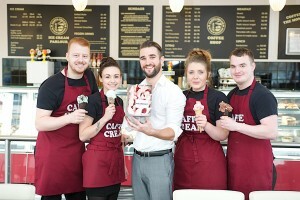 Caffe Cream, based at Marine Point in New Brighton, won the sought after ‘Wirral Taste’ Award thanks to its famous craft ice cream that is made fresh on site every day using locally sourced ingredients. Last year, the ice cream parlour was awarded with ‘Manager of the Year’ and ‘Outstanding Customer Care’ at the Wirral Tourism Awards too. Caffe Cream is also shortlisted for the Taste Award at next month’s Liverpool City Region Tourism Awards 2015. The business has become so popular that the owners have recently purchased a new premises in Wallasey in order to create a gourmet ice cream factory – the first of its kind in the country. 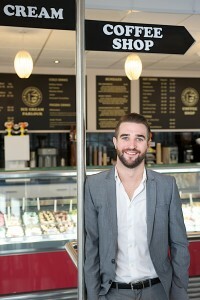 Caffe Cream will be using it to make even more of their craft ice cream, including the Salted Caramel flavour which won a special diploma of merit at the National Ice Cream Awards earlier this year.